The Navy's Blue Angels will be returning to Hawaii next month to perform in two air shows. Here, the team soars over Kaneohe during their last visit. 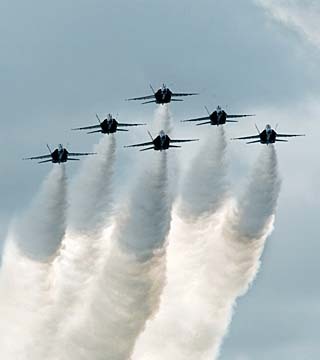 Following on the tails of the Air Force Thunderbirds, the Navy's Blue Angels aerial demonstration team will arrive here in early October and perform two air shows over Kaneohe Bay. The F/A-18 Hornets of the Blue Angels will spend a week at Marine Base Hawaii at Kaneohe before putting on two shows Oct. 13-14. The Windward Oahu base will be open to the public that weekend. The six 56-foot jets will arrive on Oct. 8 and will practice their intricate maneuvers over the Marine base throughout the week, a Marine Corps spokesman said. Like the Thunderbirds, the team that performed Saturday over Waikiki, the Navy combat jet fighters will fly in formations that bring them within inches of each other at times. On Oct. 12 a special performance will be held for island schoolchildren. As in the past, part of the Blue Angels' show will include "Fat Albert" -- the team's support aircraft -- a Marine Corps C-130 Hercules. During the show, the C-130 will use its jet-assisted takeoff system and will reach an altitude of 1,500 feet at a 45-degree angle in just seconds. "Fat Albert" carries 25,000 pounds of cargo, 45,000 pounds of fuel, and transports the squadron's support and maintenance crew to each show site. The Navy is still investigating a crash of an F-18 jet that killed Lt. Cmdr. Kevin Davis on April 21 during a Blue Angels show near Beaufort Marine Corps Air Station in South Carolina. The jet crashed into a wooded residential area. The gates to the Kaneohe flight line, where the air show will be held, will open at 9 a.m.
Only diaper bags, backpacks, handbags and bags 8 1/2 by 11 inches or smaller will be allowed into the show area. Folding chairs, lawn chairs and umbrellas also will be allowed. No coolers, ice chests, alcoholic beverages or pets will be allowed. All people and items will be searched at entry points to the flight line. The weekend activities -- dubbed "The Blues on the Bay" -- will feature a car show, food booths and numerous static displays ranging from jets to helicopters, and transport craft to classic military aircraft. The last Blue Angels show at Kaneohe Bay in 2004 attracted nearly 80,000 people. Hawaii is the 15th stop on this year's tour. Admission to the event is free. However, grandstand, box seats and chalet seating will be available for purchase at www.bluesonthebay.org.